I've just finished another 5 week stint of nightshifts baking in Dunbar, which is on the coast, just south of Edinburgh, Scotland. I have run a couple of courses too, and kept up my commitments in Northumberland for the Farmers' Markets...so it's been a very busy time and I need a break...so does Alison, who has a much more stressful job than I have, though with more sociable hours, of course. I have had only limited time to look over the TFL pages of late, and commenting has really not been possible; my apologies for this. I know I will have missed looking over some great bread from the many fine bakers who post here. I've been listening to a feature on the radio just now which is claiming an increase of 20% in numbers looking to leave the UK for a holiday abroad this Easter; and why ever not? A heatwave this time last year, now we have the coldest March on record. I'm reading it will be 26*C in Heraklion on Saturday..so our South Coast haven will probably be a degree or two up on that scorching figure. 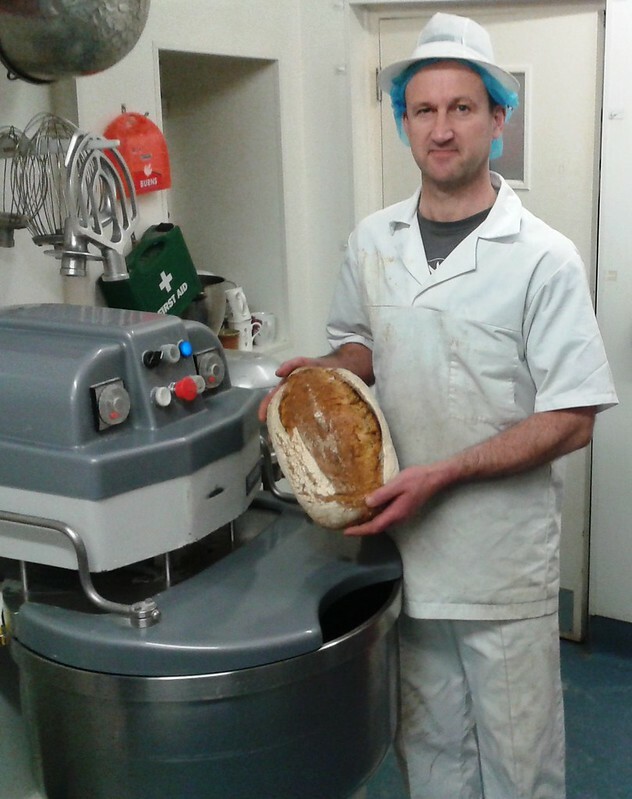 Here's a photo of a very happy baker at the end of last night's shift. I'm holding a 1200g loaf of Pain de Campagne. I'll be making some sandwiches with that in a few hours' time as we drive down to Gatwick airport overnight tonight to catch a morning flight to Heraklion early tomorrow. Have a wonderful holiday, Andy. You certainly deserve it! Hopefully you can bring back some sun. This cold weather has lasted long enough! away from things especially when the weather is miserable. Enjoy Crete and have good Easter with Alison. The bread looks very nice indeed. Spring Break! I'm looking forward to photos! My or my - the hours you keep! I simply couldn't do it. I would fall asleep for sure in the middle of a shift. I never was one who could adapt to graveyard shifts though I know there are people who adore working those hours. If the sun is up - so am I :-). Plans for your holiday sound great especially with the weather you have been having. We have had a lot of snow here but we have needed the moisture badly so most do not complain. Hard to complain when you have a beautiful fresh snow fall one day and bright blue sunny skies the next.....such is the spring weather where I live. Have a great time relaxing Andy and Alison it seems funny i just mentioned a holiday for you and Alison on my last blog the other day, suggesting sunshine and beaches but a little further a field than Crete! Nothing like sun break after a long dreary winter to rejuvenate the spirits in time for Spring. Hope you and Alison have a wonderful holiday Andy and look forward to seeing what you bake in that nice little WFO at the anotolika this time around. That is one happy baker! Great to hear from you, Andy! The weather seems to be what most people are talking about in England at the moment (at least now that the horse meat scandal is ageing), and for good reason. It's not every year that Welsh farmers have to dig their sheep out of the snow in late March. I wish you all the best and a lovely holiday in more hospitable environments. You should be there by now, so enjoy! Hope the weather is good for you, as well. Have a great time on Crete, Andy! and have a wonderful trip, Andy! Once I had finished my last shift and grabbed a bit of sleep, we were on our way to Greece before I could post up any sort of reply. The internet connection using my dongle was a complete waste of time on the South Coast, so it proved impossible to visit TFL on holiday. Finally I have managed to put a couple of videos together and report on our time in Crete.